The Wheel of The Year represents the annual cycle of the Seasons and their Midpoints. It is traditionally associated with Paganism but has its origins stretch very far back into Celtic Society where the coming and going of the Seasons, the shortening and lengthening of daylight hours impacted strongly on this agricultural race. The Wheel itself is divided into either Four or Eight Points. When divided by Four each Point is referred to as a Quarter Day and it is these that mark the Two Solstices at Mid-Winter and Mid-Summer. Mid-Winter sits at the most Northerly Point on The Wheel, while Mid-Summer sits at the most Southerly Point. The other Two Quarter Days are Equinoxes; Spring/Vernal Equinox known as Ostara and Autumnal Equinox known as Mabon. The Vernal Equinox’s Point lies exactly mid-way between the The Winter and Summer Solstice and is positioned to the East of The Wheel. The Autumnal Equinox’s Point is positioned to the West of the Wheel mid-way between Summer Solstice (Litha) and Winter Solstice (Yule). When divided into Eight, the Mid-Points between the Quarter Days are included and recognised. 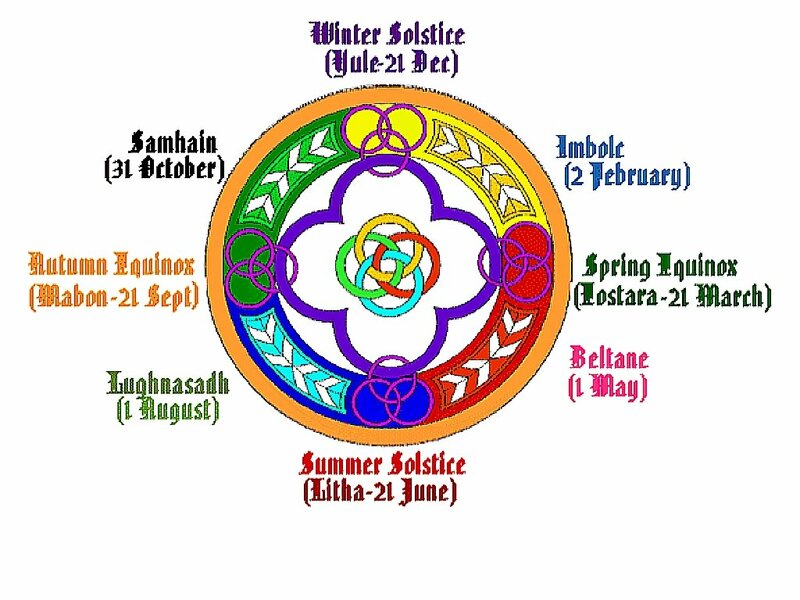 So we have the Mid-Point between Winter Solstice and Ostara known as Imbolc, the Mid-Point between Ostara and Summer Solstice known as Bealtaine, the Mid-Point between Summer Solstice and Mabon known as Lugnasagdh and the Mid-Point between Mabon and Winter Solstice known as Samhain. These days are referred to as Cross Quarter Days. Pagan traditions vary, some celebrating the Four Quarter Days while others, both Quarter and Cross Quarter Days. Dates and associated names also vary. Regardless of tradition, whether acknowledging Four or all Eight, each of these Days are celebrated and feasted. The Four Seasons are celebrated as Solar Festivals while the Cross Quarter Days are celebrated as Fire Festivals. The Wheel represents the Cyclical Nature of the Seasons and their impact on light, weather, heat, productivity of the land, along with the beasts that inhabit it. The ever turning Wheel also has an effect on us humans and can very much determine our lifestyles, activities and moods depending on which point The Wheel is moving through. The Wheel highlights the nature of birth, growth, decay, death and then re-birth through our observations of the Seasons. It symbolises the orbit of the earth around the Sun which is the cause of each season. The ever spinning Wheel moves slowly and at some stages of the year, it seems to almost grind to a halt as we seem to experience the harshness of cold weather, darkness and decay for much longer than we seem to experience warmth, light and growth. Autumn can set in too quickly, giving us an early taste of the chill of winter ahead. This makes the Seasons appear to run straight from Summer into Winter, often taking us by surprise. As Winter moves into Spring it appears to take too long to make its presence felt, and we feel it has been a long time since we experienced the heat of the Sun and the joys of sitting comfortably outdoors enjoying our gardens, the scent of flowers and the lushness of growth around us. Then too often than not, we have already sacrificed half of our Summer, and the longer daylight hours before we get a taste of what Summer is supposed to be about. For many of us in the Northern Hemisphere, when Summer decides to eventually grace us with her presence, we go mad with excitement, rushing out to buy garden furniture and throwing daily barbeques. We know we have to make the very most of it because there is a very good chance it will not last for long. Sometimes in Ireland we may only get two to three weeks of really decent weather, and for those who have booked their vacations for this time, they are viewed as been extremely lucky and fortunate. However, there is a very good chance for most who decide to vacation at home with their families during the Summer Time, that they will be what we call ‘washed out of it’ with rain and chilly conditions. Many a time I have sat in holiday locations staring out the window at the driving rain, unable to see the coast-line as the heavy sky sits on the ground. Packing becomes a nightmare as you have to allow for both Summer and Winter wear, as you never can tell. Even if the weather forecast has predicted a belt of high pressure coming into Ireland, it is often wrong. The Irish Weather Forecasters are far better at accurately predicting bad weather than they are at predicting good. It is really hit and miss during the Summer in Ireland. In other more Southerly parts of the World they can reasonably expect the see a difference between Seasons. They get a Winter, Spring, Summer and Autumn, and can plan their activities and life around them. However, in more recent times we have all experienced dramatic climatic change. While we in the Northern Hemisphere may be getting washed out of it during the Summer Months, unable to get use out of our light clothing, the people in the Southern Hemisphere are being scorched or destroyed by freak tornadoes, hurricanes and drought. Some countries are experiencing weather they have never seen before. Snow where it never fell before and earthquakes completely unheard of up until now. It is for sure that our climate has changed and The Wheel of The Year has not yet caught up it. For our Celtic Ancestors the Seasons must have been more obvious, although they did experience droughts and floods from time to time. Many of their Festivals and Celebrations to mark the changing Seasons were designed to pay homage to which ever God or Goddess reigned over that period of time. They held certain rituals and offered gifts, honouring their God (Sun) or Goddess (Earth) in an attempt to safeguard their families and livestock. The Celts were an agricultural race and so the land and their livestock meant everything to them. They had to work hard and ensure that what they planted or sowed would flourish, providing food and nourishment for the continuing health and existence of their tribe. Their livestock would only thrive if they had good land to graze upon. Without the co-operation of The Sun and Mother Nature, the God and Goddess, they could go hungry and without, or worse still starve to death, their tribe wiped out. They watched the movement of the Sun in the sky and looked for signs upon the Earth and its creatures to determine what was to come, and what work needed to be done. A bit like we now do in Ireland, the Ancient Celts divided the year in two. For them there was the Dark Side, Winter which began at Samhain (Summers End) and was also the beginning of their year. The Light Side, Summer was marked as Bealtaine. They also commenced their festivals at dusk rather than dawn. This makes the Celtic Wheel of The Year slightly different to the modern day version. The Celts closely honoured the Moon Cycle as it Waxed and Waned. The Moon was seen as Feminine while the Sun was seen as Masculine. They understood that balance was needed between both to ensure natural cycle of the Seasons. The Earth was the giver of life and was seen to give birth each year to the entire natural world. Deemed as Feminine, she was powerful and ever-giving during the Light Time of the year when her presence was strongly felt through the visible signs of growth and abundance, when everything sprang into life and flourished. With the shortening days, and the Waning of Light, she eventually disappeared into the underworld for her confinement while incubating new life, a new Sun which would be birthed at the Mid-winter Solstice. Then it was only a matter of time for The Goddess to recover from the birthing process when she would re-emerge with her new born Sun and breathe life and light into the land once more. It was a delicate dance both the God and Goddess engaged in for some time after, that but it was a cause for mass congregation and celebration. The Goddess is often seen as The Triple Goddess, The Maiden who brings light back to the Earth, The Mother who conceives and gives birth, but also she plays a vital role as The Crone. 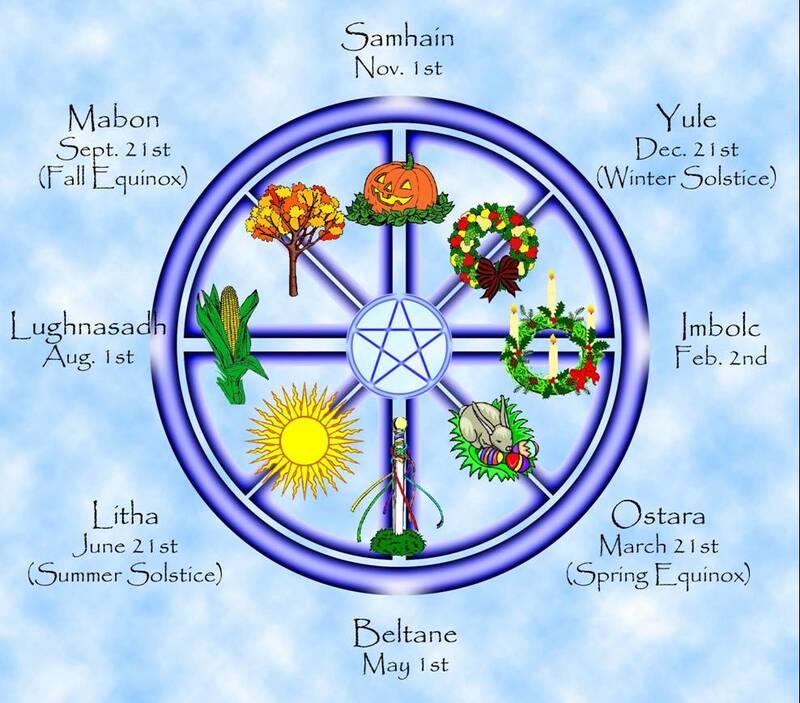 Each Aspect of The Goddess rules over certain Seasons and times on The Wheel of The Year. The God and Goddess’s became stronger and stronger as The Wheel Turns from Winter Solstice onwards. They reach the height of their strength at Summer Solstice, the longest daylight time of the year. 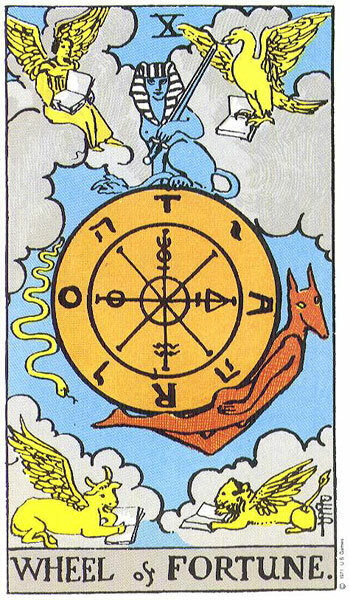 But the Wheel is forever turning, and with each day that passes after that, they begin to lose strength, eventually reaching a point on the Wheel where both day and night were of equal length. From then on the days became shorter, the light of the Sun Waning until Winter Solstice, the shortest day, when it is once more born again. When the Wheel reaches its lowest point of rotation, it has nowhere to go but up once more, and so the cycle repeats itself over and over as it has done since the beginning of time. When the strength of the Sun began to Wane as the days, weeks and months passed, the ancient people of the land knew that before long, the land would yield little, the livestock would need to be taken down from their high pasturelands, the weakest and oldest killed to provide food for the tribe while the strongest would need to be kept fed during the long winter months. When the Sun sank to its lowest point, they knew that daylight hours would be very short. With the shortening of the days came the cold, and little could be done but to retreat into their dwellings, build fires and ration out food so that they could survive until the Sun was reborn once more. They knew that once re-born, it would be only a matter of time before life would come back to the land as it did every time The Wheel completed its full cycle. For The Celts, time was cyclical and not linear. They also believed the birth, death and re-birth of human beings. 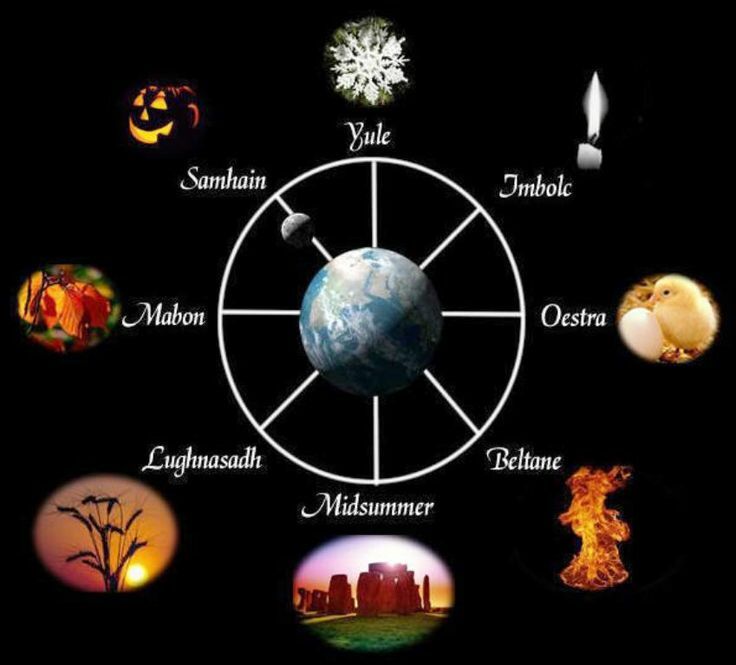 The Wheel of The Year that is popularly known to Pagans and Wiccans is quite modern as not all the days on the Wheel would have been acknowledged or celebrated in ancient times. Certainly the Solstices and Equinoxes were noted for their importance, but the Cross Quarter Days may not have been celebrated. However since the dawn of time people have observed the coming and going of the Seasons, and both Solar and Lunar movement. Today, Pagans, Wiccans and Witches celebrate these Seasonal Festivals by mixing both Ancient Tradition with a more modern and contemporary approach. The Sabbat Cycle I write about is based on the Northern Hemisphere where I live. *Just Click on the Links to find more detailed information. Only the Links Highlighted have been completed. As each Seasonal Festival Approaches, information, Mediations and Tarot Spreads will be made available and Uploaded.